Let freedom ring! It’s the 4th of July here in America and we are getting ready for a festive day with friends, family and fireworks! Many of my customers are in, or have close family members in the service. I would like to take a moment to say Thank You to all of our men & women actively serving in the military, and to our veterans. 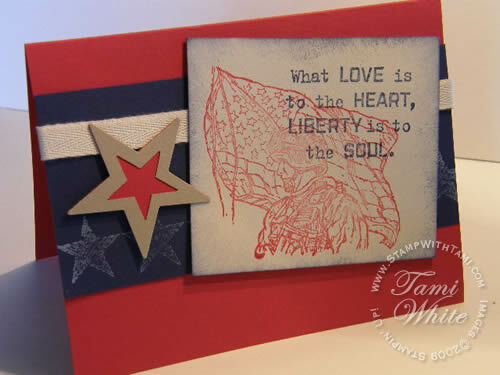 I love Stampin’ Up!’s patriotic stamp sets, The Free & the Brave has been one of my favorites. I was really sad when it retired in June. I used it one last time at my June stamp club class. When I got my first peak at my new catalog, and saw the new stamp set Courage, I was over the moon! I may even love Courage more. Kudos SU for wowing me yet again! This first card is a re-creation of our stamp club card with the retired set, and it uses the brand new Courage stamp set and the Hero jumbo wheel for the background. The second card is the original. Love the second card. Really a nice set of stamps to help us remember the freedom we have and those who have fought for it. 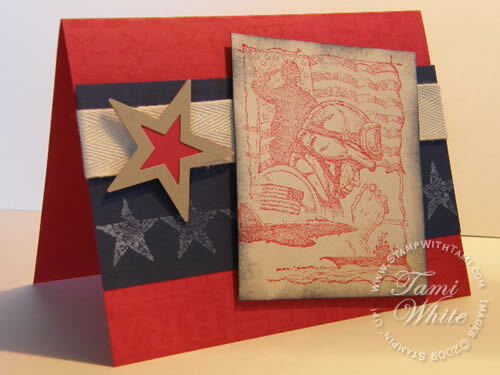 I want to get together with my friends and make cards to send to the Troops.. what an inspiration ! !